Author Andrea Codrington discusses the opening titles for The Island of Dr. Moreau, from her 2003 book Kyle Cooper: Monographics. 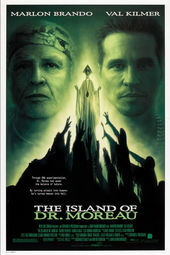 From the very beginning of visualizing the title sequence for The Island of Dr. Moreau, Cooper knew that the theme of biological mutation would be paramount. Through a series of explorations with storyboard artist Wayne Coe, Cooper honed his sequence from an initial direction of eyes splitting and multiplying as if going through cell mitosis to the ﬁnal direction, which begins by pulling the viewer through a series of animal irises. In this way, Cooper intimates the ﬁlm's plot inter-species biological tinkering gone awry. The resulting sequence is aggressively paced to a driving hip-hop beat, a hallucinatory combination of medical and cellular imagery from a number of stock sources that could possibly pose serious problems to epileptics in the audience. “I usually do things with scissors and scan them in,” says Cooper, who admits to a preference for hands-on, low-tech approaches to projects. In The Island of Dr. Moreau, Cooper uncharacteristically turned to Illustrator for help to pull out the edge points of the credit typefaces to render them ﬁguratively red in tooth and claw. The credits appear at ﬁrst normal, but then the serifs spike out dangerously and begin to mutate and splinter as if they, too, were going through an out-of-control metamorphosis.